This integration will allow you to connect with Xero and start collecting your data. Our Blendo – Xero connector queries the accounting data for your Xero organizations and syncs it to feed your BI, your data warehouse, or your custom analytics stack. In order to setup this integration, you will need to create a connection through the Xero Developer Centre. We will see that bellow step-by-step. For now, let’s add this integration to Blendo. 1. To add this integration, go to Blendo dashboard. 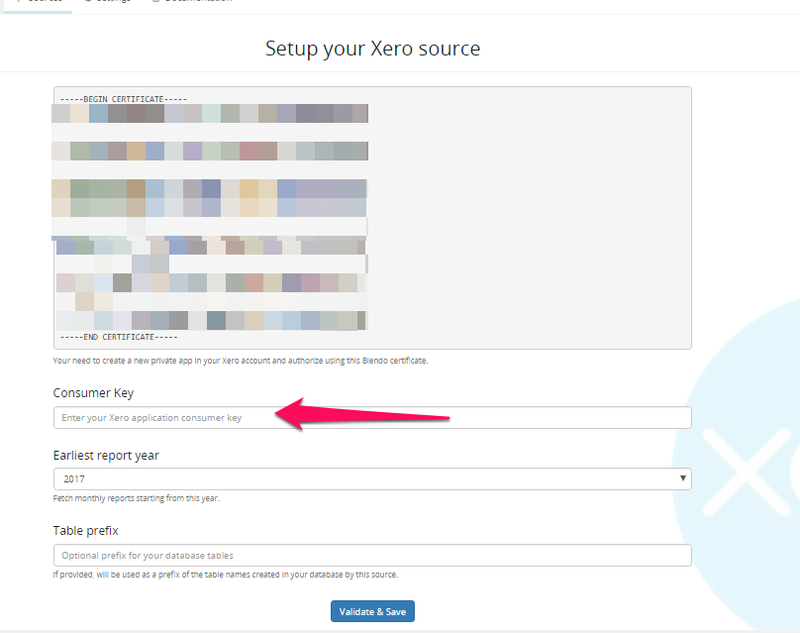 Click Add a Source and click on Xero icon. 2. 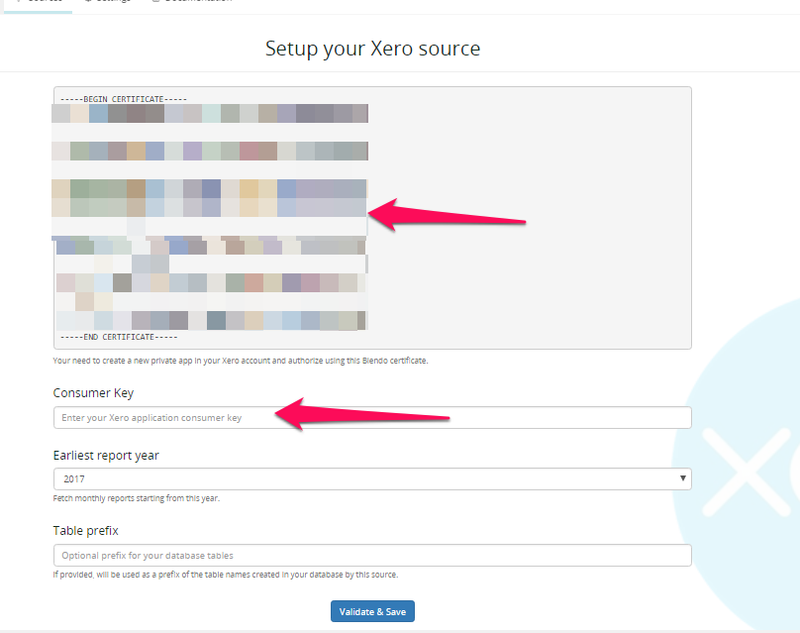 Next, you will be prompted to Setup your Xero source. 3. 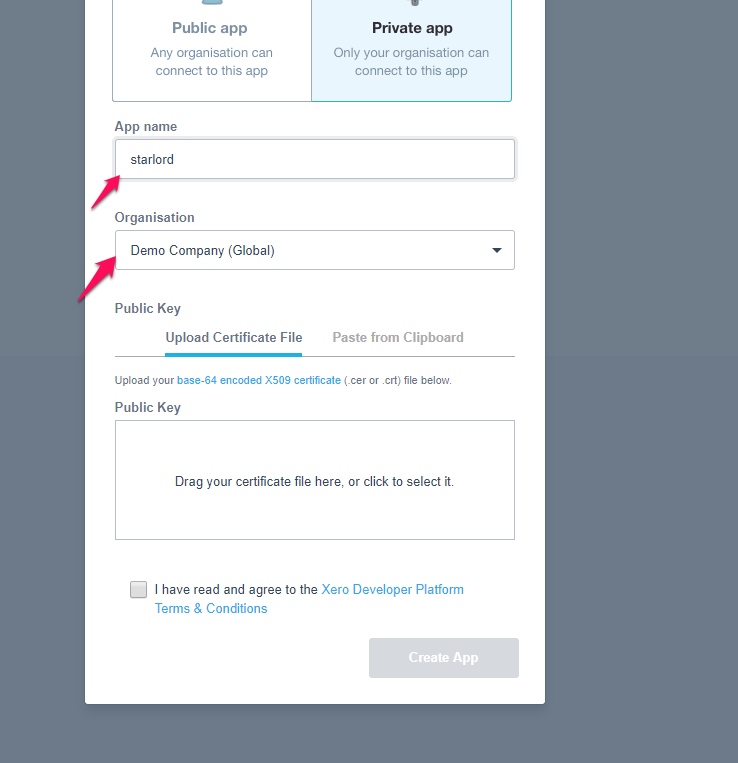 You will notice a boxed window containing your X509 Certificate and Consumer Key and they are both needed to connect to Xero. 4. If you do not have an account in Xero Developer Center then create one here and log in. 7. 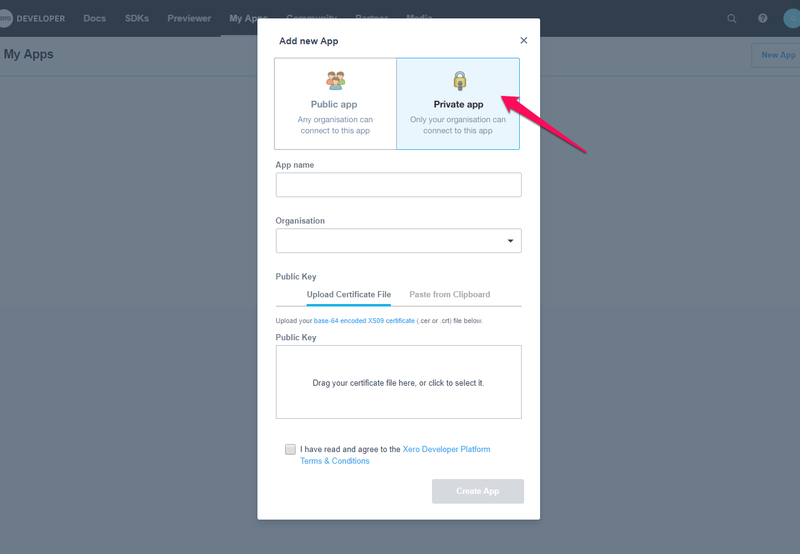 Provide an Application Name and select your Organization from the drop-down menu. 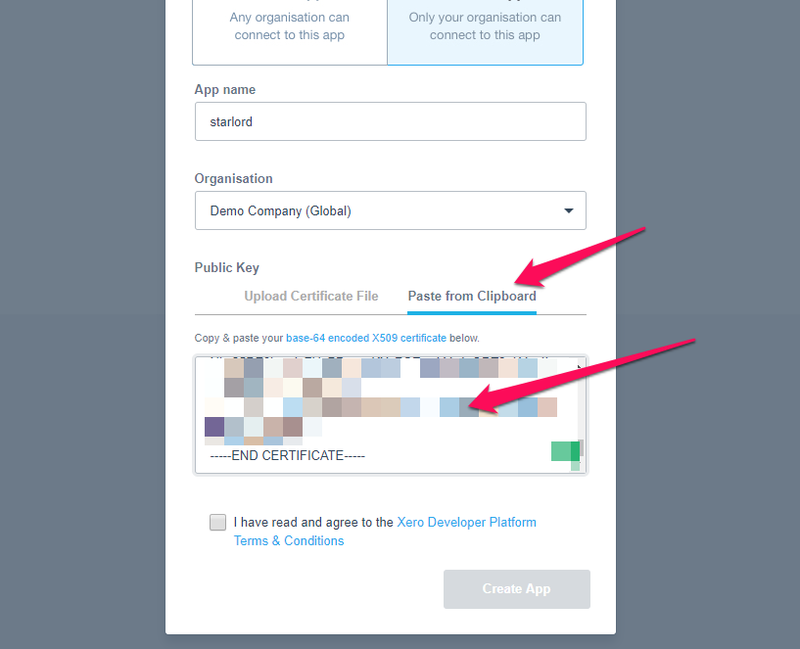 9. and paste it in the X509 Public Key Certificate box in the Paste from Clipboard tab. 10. Read the Terms and Conditions and if you agree, check the checkbox. 12. In the new window, click your new app. 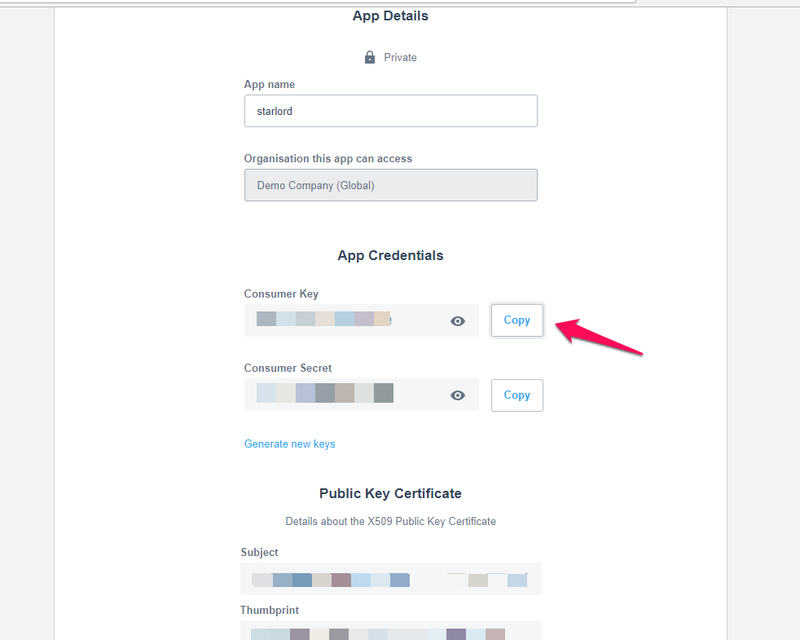 13. you will see your App Credentials. We will need the Consumer Key. Click Copy. 14. Go back to Blendo modal and paste the key into the Consumer Key. 15. Next please choose the Earliest Report Year you want us to sync in. 16. Add a Table Prefix and choose your Database Schema if needed other than public and click Validate. 17. Then you will return back to the home dashboard. Click on your new Xero data source. For a new integration, Blendo will schedule an initial sync job. That will include the historical data and may take some time to complete. This configuration controls how often Blendo will pull data from your Xero integration. Loading to your data warehouse could take a little bit longer. 18. If you want to change the replication schedule go to the Schedule section and click on Reschedule. 19. In the next pop-up select one of the options available and click Apply. To help prevent overages, consider setting the integration to replicate less frequently. Ask us for help or recommendations. When Blendo first connects to Xero Data source, will schedule an initial sync job. That will include the historical data and may take some time to complete. If during the Xero sync you see a message that your Import Failed with “Sorry, Please enable order management site setting to use this API“, that means that we are not able to sync your Orders resource. This is because you will need to enable the Enable Order Management in Xero’s UI first so Blendo can have access to your Orders resource from the API. For more details please check the documentation from Xero.